Using old newspapers seems like a great idea, but in reality, all the ink can rub off onto whatever it is you’re wrapping. Plain tissue paper without any ink is a much safer bet and can save you from having to wash everything when you unpack. If you don’t want to empty drawers to move a dresser, that’s fine. Just use stretch wrap around the whole piece, drawers and all. As long as the piece isn’t too heavy to move, you’ll be fine. You can also stretch wrap pictures to keep hanging wires from getting snagged on other things, or smaller items like jewelry boxes that have drawers that easily slide out. You can even wrap wires to stereo speakers. It’s a huge time saver, plus you’ll have all the cords exactly where you need them when you unpack. It also only sticks to itself, so you don’t have to worry about any residue on your belongings. Duct tape comes in a huge array of colours and patterns. Just pick out a different colour for each room in the house, and you’ll know exactly where that box goes at first glance. Kids can pick out their own colours, which helps them feel better since they know exactly which boxes have their favourite things. It also helps to write a note, just a few bullet points, listing what items are in each box. If you don’t want to colour code everything, be sure to label every box with where it goes. Everyone has at least a few items in their closet that don’t react well to being taken off the hanger and stuffed into a box or suitcase. Wardrobe boxes solve that problem. These specially designed boxes have a bar going across the top, so all you have to do is take the clothes out of the closet and hang them in the box. It works really well for suit jackets and blazers. If you’re moving in the summer, using a separate wardrobe box for winter items will help you unpack what you need first. If the clothes are going to be in storage for a while, consider tossing a fragrant cedar block in the box. Mothballs are another option, but getting the strong mothball smell out of your clothes can be a challenge. If you’re going to be storing breakable items for a long time, then you should consider getting premium bubble wrap. This type of bubble wrap stays inflated much longer and comes in perforated sections like paper towels so you only have to tear off the amount you need without having to worry about keeping scissors handy. Using large boxes for books, movies, and games is a terrible idea. If you start with a large box and fill it with books, then there is a strong likelihood that once it’s filled, it’ll be too heavy to lift. Try to avoid using boxes larger than 1.5 cubic feet for these things. It’s much better to use a ton of smaller boxes that can be easily lifted than a few big boxes that are impossible to move. It’s also a good idea to use heavy duty boxes for books to prevent the weight of the books damaging the box. Glassware is easily broken but takes forever to wrap. A dish packing kit can save tons of time and still keep your glassware protected. These kits usually come with an insert that fits inside a box and sleeves of a foam type material. The insert makes a grid inside the box that has a hole for each individual glass. Just put your dishes in the sleeves before putting them in the box. The foam sleeve protects your glasses from banging against the box and being damaged that way while the cardboard insert keeps your glasses from banging against each other. More expensive packing tapes will not tear or split as easily as cheaper brands. Ultimately, since you won’t have to use as much tape to seal the boxes, you could wind up saving money. More expensive tape is often made of stronger material and has better adhesive, which means it will hold more weight. There are tapes designed specifically for moving, so that may be something to consider for your move. Furniture covers not only prevent dirt from getting on your furniture, they can also prevent mold. Check for covers made from polyurethane, as this material won’t tear easily and still breathes. This allows for air circulation, which is key to preventing mold. These things are incredibly handy. They’re perfect for those annoying items that don’t always fit in a box, like quilts or pillows. Just toss them in a contractor bag and you’re good to go. They are designed to handle waste from construction projects, so they’re not easy to puncture or tear, which makes them great for disposing of virtually any unwanted item. They can also haul almost any unwanted item to a donation bin without tearing. Really, these things are an often-overlooked essential item. 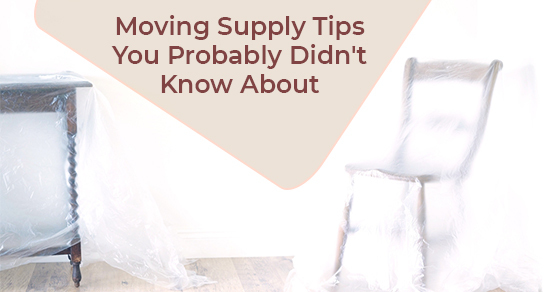 Using all of these moving supply tips will make your moving process much easier. If you need more moving ideas or assistance with storage options, don’t hesitate to Jiffy Storage. Our office hours are convenient for most schedules and even includes Sunday hours, so we’ll be able to help.